Ultra low loss Teflon PCB; tightly controlled dielectric constant. 0.12 dB insertion loss maximum; 0.1dB typical. -23dB return loss; -25dB typical. 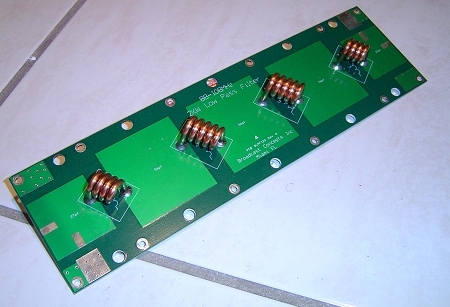 -45dB rejection at 176MHz. That's the 1st harmonic of 88MHz. Measures 11 inches long x 3 inches wide. For exact dimensions and mounting hole locations click here to download an autocad DXF drawing.